Denver’s leading Professional Roofing contractor. We all know that storms just seem to keep getting more and more severe. 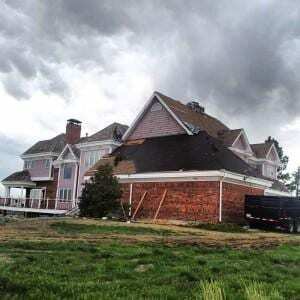 Many areas have been pounded this year alone, and there’s nothing more devastating than the feeling of loss a family gets when they have roof damage. Ice, sun, and hail are main culprits that threaten the longevity of a roof, and the process involves many critical steps that are important to protect you. Arriving on time, diligently explaining each step of the process, and a level of expertise in working with adjusters are key things that build customer satisfaction in the roofing realm. We are proud to be fully certified and insured, and strive on a daily basis to bring unparalleled quality and make all of our customers expect nothing less than 5 star treatment. Trust is key when hiring a roofing contractor. At JRC Exterior Solutions, we strive being a roofing contractor who builds trust in the community and roofing industry. Our roofing repair reputation is our most important asset, and we are proud to be one of the highest rated contractors around. We provide local commercial roofing and residential roofing services. When it comes time for your next roof, be sure to call to see all that we have to offer. Your home, or business deserves the protection afforded by utilizing quality materials and professional installers who can tackle any issue they may encounter. We have decades of roofing experience and our highly trained staff will treat your home or business professional. We understand that the mess and intrusion of re-roofing can be lessened using common sense tactics. Shingles are the most common residential roofing system. Over the years shingle roof types, colors, and options have grown tremendously. We will be happy to make suggestions about colors, styles, and various other options that may be available. We offer many options that will add to the beauty of your home, and low-maintenance and stain resistant shingles are available. In most cases, metal roofing provides superior protection and longevity when compared to most shingles roof systems. With a multitude of colors and styles available, you are sure to find a metal roof that will compliment your home. The professionals at JRC Exterior Solutions can install your new metal roof using techniques that will ensure that your roof will last for many years to come. Tile roofing offers a distinct look that is often used on finer homes and buildings. Tile provides a long-life solution while adding beauty and performance that will add value to any home or office. Our expertise with tile roofing installations is seldom matched, and you can be confident that it will be done correctly the first time. Slate roofing is one of the longest lasting roof systems available. Its beauty is unparalleled, and will provide your home with a regal look that cannot be matched by any other roofing type. Slate roofs will defend your home from wind storms and hail damage, and require little to no maintenance. No two slate roofs look the same, and our expert installers will ensure that your roof will last for decades.